It feels a little silly telling you about the necessity of a duffel bag. After all, it’s purpose is one of function. A means of getting your gym gear from home to office to gym and home again. What is not inherent however, is the bag's look, construction, or quality. It feels a little silly telling you about the necessity of a duffel bag. After all, it’s purpose is one of function. A means of getting your gym gear from home to office to gym and home again. What is not inherent however, is the bag's look, construction, or quality. It seems like every year we get older it gets that much harder to get to the gym in between our busy work schedule and personal obligations. It’s not uncommon to see a man carrying his gym essentials into the office with him along with his messenger bag or briefcase. It is surprising though, how these men will spend a small fortune on their messenger bag because it’s a part of their professional image, but use the same duffel bag from high school gym class. What’s the point of the nice suit if you have an ugly plastic bag with a big logo on it draped over your back? A duffel bag needs to not only serve as a carryall, but it must be maintainable. It doesn’t take long for gym shoes and a wet towel to wreak havoc on a synthetic bag, and Febreeze can only do its magic for so long. 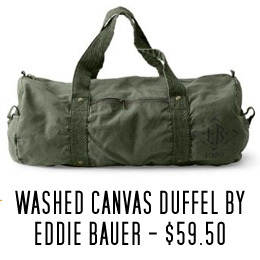 Opting for a canvas bag like the one seen here by Beckel Canvas, allows for easy cleaning and maintenance. When it starts getting funky, drop it in the washer. Beckel Canvas should get an entire article for themselves. A small, proud, family owned American company from Portland started as, and continues to be, a canvas tent manufacturer. A large portion of their products are built for camping, and they’re proud of their heritage. 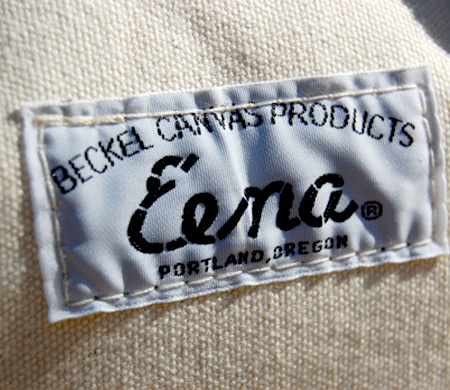 Unlike many brands that started as rugged outdoor outfitters and turned into a fashionable soft goods store (read: Abercrombie & Fitch, Sears & Roebuck, many, many more) Beckel has never steered from their mission of providing the best outdoor goods they can produce. They have, however, taken their knowledge of creating durable canvas products and produce some beautiful bags sure to last you a lifetime. On top of all this? 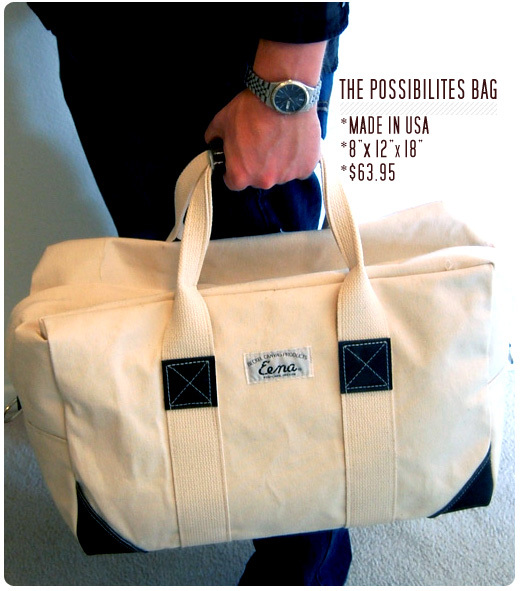 Beckel Canvas’s Possibilities Bag shown here is only $63.95. Made in Portland. For a high quality bag. $63.95. Pardon my dramatics, but that’s only $15 more than most plastic ‘sneaker brand’ duffel bags you’d pick up at a sporting goods store. And hundreds less than one you could pick up at J.Crew or similar that’s imported from God knows where. As I always say, there’s no easier way for a product to be Primer Approved than by being well-made, affordable and built right here in America. In this day and age, it’s hard to “Buy American” for everything. 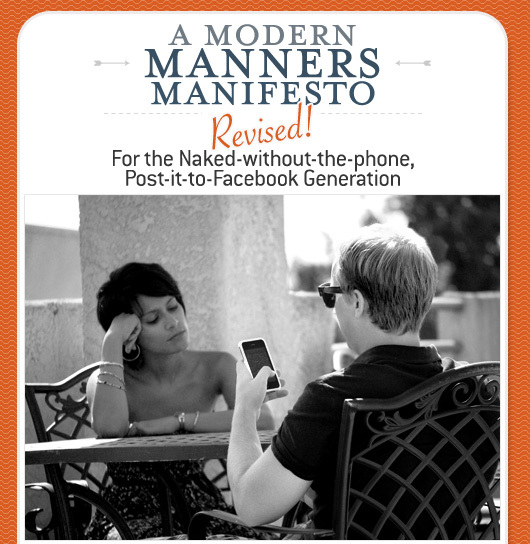 Especially for guys like us who are in a time in our lives where we have to be budget conscious. So when a brand comes along like this and slaps you in the face with it, there is absolutely no reason to buy from someone else. Beckel guarantees to fix it free for life, if you manage to tear one of these up. Why do you need a $63 dollar duffel to carry your gym clothes in? If you’re asking that, you’re right, you probably don’t, other than the reasons I already listed. You can definitely use a plastic grocery bag to carry gym clothes in, if you’re only carrying them from your car to the locker room. But a guy should have a duffel for more than the gym. Every man should have a weekend bag, as we’ve discussed before, and the Possibilities Bag would be a great candidate for short trips. It’s the perfect size for a soft carry-on. The uses are endless. Think about anytime you go anywhere that you need to carry stuff. Going to the beach with your girlfriend and her friends? 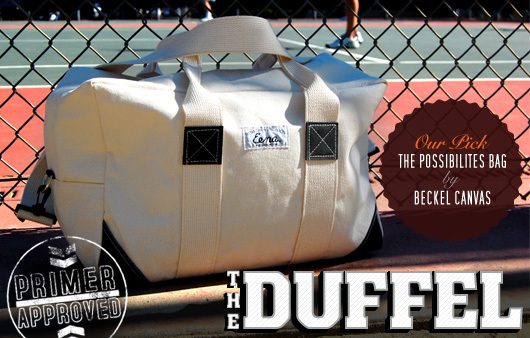 A canvas duffel is the perfect choice to carry all your stuff. Surprising your significant other with a picnic? 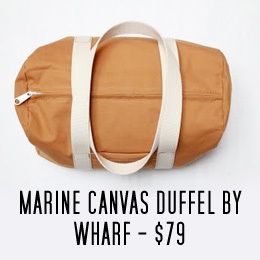 A canvas duffel will stylishly, and functionally, carry your blanket, wine and food. If you opt for the bag from Beckel, please note the shoulder strap comes separately, so decide if you think you’ll need it. Here are some alternate options, though I think I’ve made my first choice clear. First off, I love Beckel! Old school American cool. Now, I’d like to suggest the Olive Drab War Bag as well. My reason for this is that it’s got some color & can be used as a carry on when traveling. I like versatility in my pieces. The larger Round About bag is perfect for road trips, camping, long weekends where you need a bit more space. With these two pieces I can pack for almost any short get away in style! This is definitely an upgrade that I need to make. I like the support for a small, family-operated business. Gunnar, the olive drab war bag looks awesome! It looks like it would make a great weekend bag, and I agree the color is very cool. Billy, I completely agree. I like to support small, family owned businesses when I can. Sometimes that’s cost prohibitive, but that’s not the case with Beckel. Definitely give them a try, I’m very happy with it. Yep! It’s my new carry on. Finally gave up on my roller. I have to tell you about my experience w/ Beckel. When I was looking to buy this bag I was a little concerned about the time it takes to ship an order so I emailed. I received a reply within 12 hours explaining that bags are made to order by 1 person & that’s the reason for the time delay. I was so impressed I called immediately the next morning to order. The gal who had emailed actually was the one who answered the phone! She told me she had someone who could make my bag the next day & get it out to me! This is not amazing service. It’s service the way it’s meant to be! People who care about their company & the products it produces because that’s a reflection on them. I’m a retailer & I appreciate this value as the real American way. Please support these guys! They’re doing it the right way. Gunnar, That’s amazing! I received the bag as a gift and was told a story about their customer service that sounds very similar. A small, dedicated team who want to make their customers happy. Glad you had such a great experience! I think you chose some nice and affordable bags there Andrew. I’m not entirely sold on the Eena though. The construction looks solid but I just have this feeling that it’s gonna get dirty quick. I have a hard time with washing bags. It’s not something I’d like to do often. The Eddie Bauer (surprisingly) and the Wharf are my top picks out of your selection. Great article. I like this selection, but I share George’s sentiments that the Eena is going to look really shabby really quickly if it sees any kind of dirty surface (which includes the overhead storage bins on some budget airlines I’ve used recently). 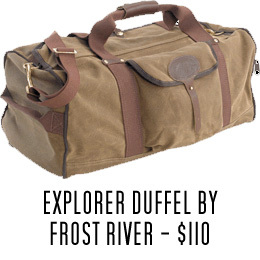 Ever since you posted the article on weekend bags I’ve been meaning to pick up a Frost River bag and the Explorer is no different, that would definitely be my pick of the five. George and Roy, I can completely understand the concern, especially if you don’t think you’ll ever want to was it. Beckel offers them in other colors, but you have to call. (They’re not listed on the site.) I believe they may have it in green and red, but you should check with them. I love my Frost River bag, also a great choice. I can’t begin to tell you how thrilled I am to see some love for Frost River in this article. I purchased the Frost River Explorer Duffel bag (Medium) for my father just days before Christmas, and needless to say, the customer service was a hit with me, and the superior craftsmanship of this item surprised the entire family. My e-mails were responded to promptly (including a reply I received about twenty minutes after my initial inquiry) and my fears of receiving it in time for the holidays were put to rest immediately. Bottom Line: You won’t be disappointed with this bag. Good post. I’m been looking for topics as interesting as this.Very informative and information presented very well. I really liked reading your post which has delivered a great information about interesting bags. I like the Frost River bag. I’m impressed. You’re truly well informed and very intelligent. The information you provided about bags is very interesting. Thanks for the share. 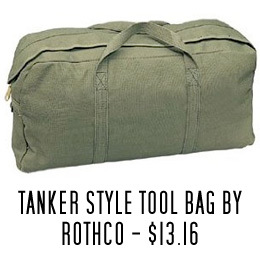 Was super stoked to purchase this item (been searching for a quality duffel bag for a long time) until I found out shipping was $15 to Southern California. Brutal! Can’t justify spending 20% of the item cost (was looking at the War Bag-$72) on shipping! Hey Andrew, I want you to know that I finally got this bag thanks to your article here. I read it a few months after you posted it and have drempt of it until now. Thanks for the good recommendation and know that the endorsements you write on here are listened to. Cheers! That’s awesome! So glad you like it! Thanks for letting me know. If you’ve continued to use this, I’m wondering how the color of the bag has aged? I’m going to get the War Bag as my go-to carry on and am torn between the off-white and the olive colors. Is the off-white as much of a dirt/grime magnet as I think it is? I use it anytime I go away for the weekend. It’s held up great, but I’m also careful to not get it dirty. I would just think about how you’ll use it and if you think it will be hard to keep clean, go with the olive.